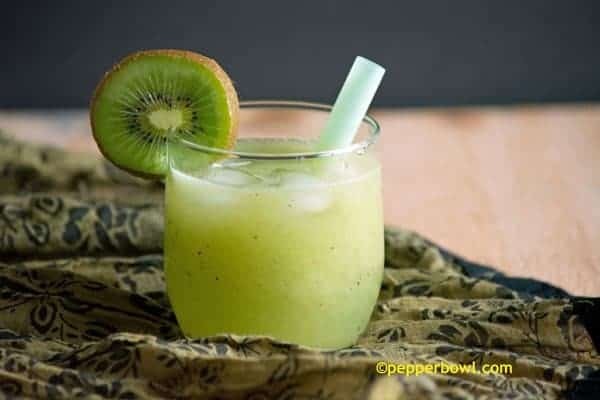 Fresh kiwi juice recipe is extremely easy and very healthy. It is little tangier, saltier, sweet, a perfect juice to surprise others. The seeds in this fresh juice adds a great texture to the juice, and the children would definitely love texture while quenching it. Wash and clean Kiwi fruit. Cut them crosswise. Scoop out the pulp with a sharp edged spoon. In a blender, Add the scooped out kiwi pulp, sugar, salt, and water. Blend it until if forms a smooth pulp. Do not over blend it, as it may crush the seeds. The seeds add a great texture to the juice, and the children would definitely love texture while quenching it. Serve it by topping it with ice cubes.